I've had the opportunity twice recently to talk about my research to a group of 14-17 year old secondary school students as part of the Women in Computer Science schools outreach programme in my department. This has been strange and interesting. The last time I had to address such a group, I was the same age as them, and they were people I had known for years. The dynamic feels very different from the other side. I felt like my first talk was more successful than my second. 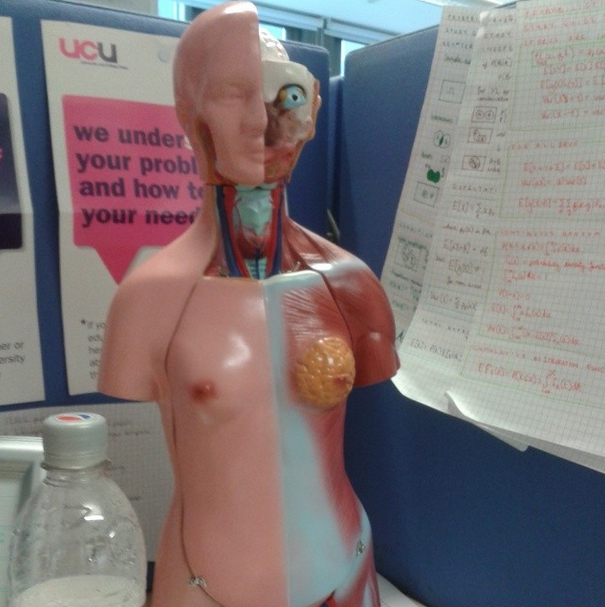 The first time I made a point of talking about the different types of computational modelling that went on in the department - aided, beautifully, by the lovely detachably-organned anatomical model pictured above. I took out her organs and passed them around the class, explaining that yes, people did model all of these things. Yes, even the naughty bits (seriously, I have a friend whose PhD project is modelling the C. elegans gonad). I think I planned this talk better and aimed it more clearly at a young audience, and I managed make the experience quite interactive with questions and answers. They were a small group, and there was one student who was clearly more engaged and interested than the rest. He answered my every question eagerly and accurately. I hadn't realised before just how much of an impediment this can be if you're trying to talk to a group! I was always that kid at school, and it drove me crazy that the teacher would wait for someone else to respond when I knew the answer and I wanted to get to the next part of the lesson already. The second time I gave a talk to school children (today! ), there were about a hundred of 'em and I was concentrating more on describing my own research, because they'd heard all about computational medicine that morning. There were fewer jokes and I spent more time trying to get them to understand the material. I think I made it a bit too dry and technical, when it needed to be more of a fun overview of the subject. However, they totally laughed at all two of my jokes. I now understand how my dad managed to maintain his stock of terrible jokes over the course of his teaching career. I was following a brilliantly charismatic speaker (this guy!) who really managed to get the kids' attention and keep them engaged. He really made sure to keep the content appropriate for the audience (social networking and selfies came up a lot!) and gave out practically every piece of information in the form of a question and answer, forcing everyone to stay alert. He made jokes all the way through and kept them laughing and happy. I'm more used to a straight lecture-and-questions format from years of university education, and I'd almost forgotten the give and take that happens with school classes. I really enjoy talking to young people and I hope to do lots more schools outreach in the future. The next time I give a talk I'm going to make it a lot more fun and a lot more interactive! I couldn't teach a class of a hundred pupils! Well done. I am very glad you enjoyed it. Next Next post: The bedroom window was a very seedy and disreputable hard-felt hat.